Weaving fantasy with the shocking details of real history, New York Times bestselling author Eleanor Herman enthralls readers in the first book of the Blood of Gods and Royals series. Alexander might one day be fated to conquer the known world, but at sixteen his kingly duties aren't exactly top of mind. Preoccupied with a strange power he doesn't yet understand and the news that his fiancée is sailing across the sea to meet him for the first time, Alexander finds the newcomer in court, Katerina, is a welcome distraction. As they grow closer, Kat struggles to keep a dark secret: her mission to assassinate the queen. Kat isn't the only one close to Alexander plotting something bloody. Rumors have been circulating about forbidden rituals being performed in the night, awakening an old magic long thought dormant and with it the Sprit Eaters. Roused by their cravings for magic and blood, the Spirit Eaters will hunt those with power to the ends of the earth and slaughter any who stand in their way. With the gods turning a blind eye, and devastation stirring at the borders of his land and within his very court, Alexander will learn that sometimes cities must turn to ash for an empire to rise. 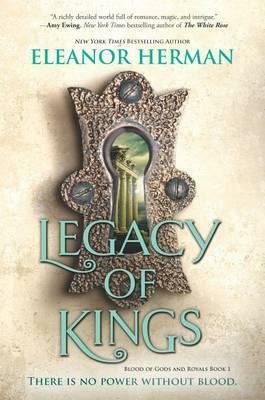 Praise for Legacy of Kings: "An engrossing combination of fantasy and history--readers who love myth and magic will devour it!" --Alex Flinn, #1 New York Times bestselling author of Beastly and Mirrored "Fantasy just the way I like it: a mingling of history, intrigue, romance, murder, and magic." --Cinda Williams Chima, New York Times bestselling author of the Seven Realms series "A richly detailed world full of romance, magic, and intrigue." --Amy Ewing, New York Times bestselling author of The White Rose "Herman mixes real history with magic, mystery and intrigue, putting the 'epic' in epic fantasy."